SLIC Toolkit has some intuitive and easy to use features that have been improved since the initial version of SLIC Dump Toolkit, which was well received by users. In addition to everything the original SLIC Dump Toolkit does this new version expands on that with new and improved features such as: BIOS information is displayed, SLP 1.0 diagnostics, serial number and certificate backup functions, SLIC diagnostic analysis capabilities and an ACPI tree structure display. On top of all these features I am still actively developing more new features and always improving on the existing ones. Supports automatic language switching from Chinese to English. Quickly and accurately extract the serial number, certificate, SLIC and other information. Supports backup of your serial number, certificate, SLIC and other information. 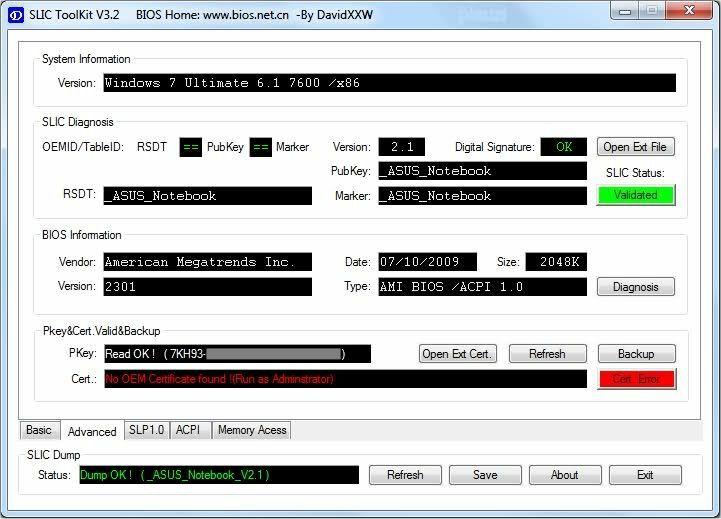 Supports the diagnosis of the backup BIOS DMI information to facilitate offline analysis. Supports the correctness of diagnosis and analysis of the SLIC, showing details of results. Supports ACPI tree structure display, similar to ACPIScope. NOTE: This tool only for technological research and validating vulnerabilities in the test environment. Does not involve the any copyrighted content, only for research and technological exchanges. Please delete within 24 hours, or for all the consequences arising from your own! Downloaded the package, but it still requires internet connection to install. Rubbish. Nevermind, I didnt see the optional file only download, no offense AfterDawn. 1 stars because AfterDawn deliberately put bundled software into Its downloader, and that AfterDawn is pushing their own "download assistant" on folks who just want the file without any nonsense. Shame on you guys.